Our paper “Crime, punishment, and causation: The effect of etiological information on the perception of moral agency” is hot off the presses. You can find it here. A follow-up paper is in the works. Stay tuned! Paul Litton (MU Law School) and I have been investigating the effect of information about the causal origin of mental disorder in criminal offenders on ordinary judgments of blame, punishment, and responsibility. Our main finding to date is that environmental explanations of disorder lessen the severity of those judgments, whereas genetic explanations of disorder do not. We expected to find that certain kinds of environmental explanation would be more mitigating than others, and in particular, that explanations involving intentional harm (e.g., a history of childhood abuse) would be more mitigating than explanations involving non-intentional harm (e.g., accidental trauma), but this prediction has not been borne out our data. Garrett Marks-Wilt and I recently got word that our paper “Exploring philosophy’s gender gap: Stereotyping, identity, and academic engagement” has been accepted for presentation at the Eastern Division meeting of the American Philosophical Association in Washington, D.C., in January 2016. The paper reports the results of a study designed to test the idea that the underrepresentation of women in philosophy can be traced, at least to some degree, to the stereotyping of philosophy as a masculine pursuit. Stay tuned for details! 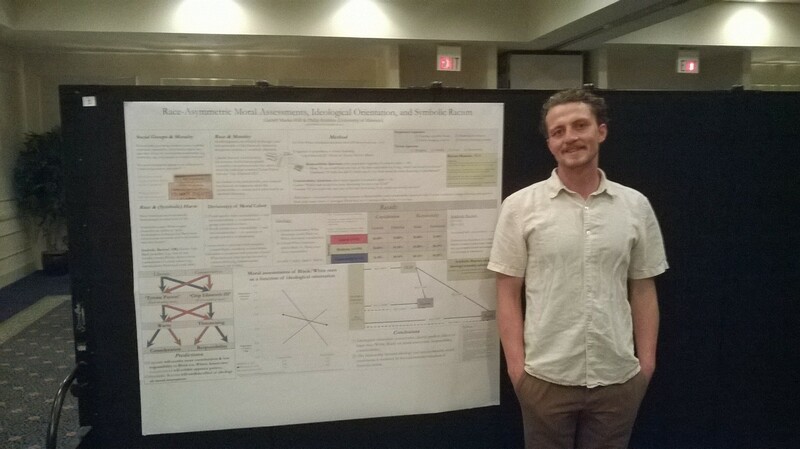 At this year’s Society for Philosophy and Psychology meeting in Durham, North Carolina, Garrett Marks-Wilt and I gave a poster presentation of our paper “Race-asymmetric moral assessments, ideological orientation, and symbolic racism.” In the paper we report the results of a study suggesting that symbolic racism predicts a tendency to assign different moral roles to Whites and Blacks, with individuals high in racism — and individuals who politically self-identify as conservative — tending to regard Whites as more deserving of moral consideration than Blacks. Tony Jack, Jared Friedman, Chris Myers, and I have a new paper in which we report the results of our research on the effects of empathy on moral judgment. The paper is forthcoming in a volume of papers on experimental philosophy of mind, but you can read a pre-publication (not quite final) version of it here. Tony Jack and his colleagues have a forthcoming paper in Neuroimage which presents evidence of competing brain networks for social and physical cognition. Their findings provide fresh empirical support for a conjecture made in our 2006 paper on the phenomenal stance.